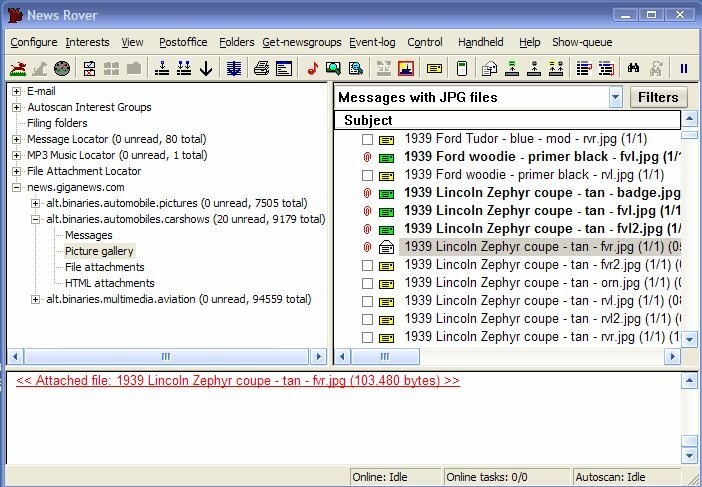 News Rover is the ultimate tool for extracting information from Usenet newsgroups. It automates the process of searching for messages, downloading them, decoding file attachments, and reconstructing files that are split across multiple messages. It does all of this automatically while you are at work, sleeping, or browsing the net. When you are ready to read messages and look at the pictures it has collected, they are ready for instant access on your computer. It does the work, so you don't have to waste time waiting for messages to be downloaded and decoded. Very greedy company. The 5 star review was obviously from the Creator of this software. Saying each upgrade is better than before. LIES! Each upgrade is put out just so they can ask for more money and has little to no new functionality. Also, even if you don't upgrade the hidden Search subscription will run out FORCING you to upgrade. Hidden lies by a greedy company. do NOT support this greed. Here we go again. Every few months the author will add a few minor features and/or a few bug fixes and slap on a new major update number on the program. In this case from 11 to 12. Then he holds out his hand for another $9.95 for the update. I guess other users of this program have also seen the pattern and have stuck with older versions as I have because the author is going to start locking out pre-version 11 users from using the mp3 and file locator features that we paid for. Quite coincidentally, the author is also raising the upgrade fee to $18.95 at the same time. I've used NewRover for three years. Each version gets better. It automaticly handles yenc, nzb and pars & rars well. I also assembles multiple part messages done with things like HJ Split. The total feature set is impressive. Other newsreaders seem quite primitive by comparison. The best feature is Auto Scan Intrest Groups. Each of these groups that you configure can automaticlly scan whatever combination of newsgroups you desire for whatever strings you select. Automatic save attachment to file of your choice. You do have to be careful with the number of messages in the que. More than 5000 usually crashes the program. Your cpu usage will soar to 100% and you'll have to do a hard close though the process manager. It seems like a hard limit within the program...4999 seems fine. I have a high performance computer with gobs of ram so its not on my end.